Thematic research group: Miss Brooks is a member of the Biogeography and Biogeomorphology group. Coastal geomorphologist interested in the importance of geotechnical substrate properties for tidal flat and salt marsh stability. 2016-Present: PhD in Geography, University of Cambridge, Pembroke College. Funded by the Natural Environment Research Council (NERC), with a CASE Partnership with the British Geological Survey. 2012-2016-MSci (Hons) in Geography, Durham University, Josephine Butler College. Fourth year thesis: A high-resolution investigation into erosion processes occurring on rocky coastal cliffs at Cowbar, UK. Third year dissertation: An investigation of palaeoseismic signals in south-central Chile and their influence on postulated pre-seismic relative sea-level rise in the 1960 Mw 9.5 Valdivia earthquake. Second Place Poster Presentation, Young Coastal Scientists and Engineers' Conference 2017 (£40). 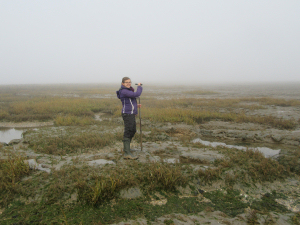 My research is primarily concerned with the geotechnical substrate properties of intertidal mudflats and salt marshes and how these properties influence the stability of these environments. During my PhD I will be using a combination of field, laboratory and remote sensing techniques, focussing on two field sites: one in Essex (UK East coast), and another in Morecambe Bay (UK West coast). Field measurements will include shear strength determination, using a shear vane and Cohesive Strength Meter. Laboratory tests will then be used to assess the substrate compressibility, shear strength (based on shear box and triaxial tests), behavioural properties (liquid, plastic and shrinkage limits) and sedimentology (particle size analysis, water content, bulk density and loss on ignition). Vertical and lateral changes to the marsh (an indication of marsh stability) will be quantified based on field measurements and marsh-edge mapping from aerial photographs. Finally, this PhD will compare (a) the geotechnical properties of the tidal flat and the salt marsh at each site, (b) the geotechnical properties found at each field location, and (c) the relation of these geotechnical properties to observed vertical and lateral marsh change over annual to decadal time periods. Brooks, H. Y., Möller, I., Spencer, T., Royse, K., Price, S. J. (2018). Geotechnical properties of salt marsh and tidal flat substrates at Tillingham, Essex, UK. Proceedings of the International Conference on Coastal Engineering, Baltimore, MD, 30th July-3rd August 2018. Brooks, H. Y., Möller, I., Spencer, T., Royse, K., Kirkham, M. & Price, S. J. (2019). Salt marsh and tidal flat shear strength: a comparison between Tillingham marsh, Essex and Warton marsh, Morecambe Bay, UK. Oral Presentation at the European Geosciences Union, Vienna, 7th-12th April 2019. Brooks, H. Y., Möller, I., Spencer, T., Royse, K., Kirkham, M. & Price, S. J. (2019). Salt marsh and tidal flat shear strength at two UK sites. Oral Presentation at CEEDA 2019 conference, Cambridge, 2nd April 2019. Brooks, H. Y., Möller, I., Spencer, T., Royse, K. (2018). Geotechnical properties of salt marsh and tidal flat substrates at Tillingham, Essex. Oral Presentation at the International Conference on Coastal Engineering, Baltimore, MD, 30th July-3rd August 2018. Brooks, H. Y., Möller, I., Spencer, T., Royse, K. (2018). Geotechnical properties of salt marsh and tidal flat substrates at Tillingham, Essex. Oral Presentation at the Clay Minerals Group Research in Progress Meeting, Sheffield, 27th June 2018. (Awarded 2nd Place). Brooks, H. Y., Möller, I., Spencer, T., Royse, K. Price, S. J. (2018). Salt marshes: strong and stable or weak and wobbly?-an update. Poster presentation at BUFI Science Festival, BGS Keyworth, 28th June 2018. (Awarded the Peer Prize for Science Communication). Brooks, H. Y., Möller, I., Spencer, T., Royse, K., Price, S. J. (2018). Geotechnical properties of salt marsh and tidal flat substrates at Tillingham, Essex. Poster presentation at European Geophysical Union, Vienna, 8th-13th May 2018. Brooks, H. Y., Möller, I., Spencer, T., Royse, K. Price, S. J. (2018). Geotechnical properties of salt marsh and tidal flat substrates at Tillingham, Essex. Poster presentation at Young Coastal Scientists and Engineers conference, Hull, 20th-21st March 2018. Brooks, H. Y., Möller, I., Spencer, T., Royse, K. Price, S. J. (2018). Geotechnical properties of salt marsh and tidal flat substrates at Tillingham, Essex-an initial assessment. Oral presentation at CEEDA 2018 conference, British Antarctic Survey, Cambridge, 19th March 2018. Brooks, H. Y., Möller, I., Spencer, T., Kirkham, M., & Royse, K. (2017). Geotechnical properties of salt marsh and tidal flat substrates at Tillingham, Essex. Poster presentation at the British Society for Geomorphology Annual Meeting, Hull, 4th-6th September 2017. Brooks, H. Y., Möller, I., Spencer, T., Royse, K. (2017). Salt marshes: strong and stable or weak and wobbly? Poster presentation at BUFI Science Festival, BGS Edinburgh (Lyell Centre), 27th June 2017. Brooks, H. Y., Möller, I., Spencer, T., Royse, K. (2017). Salt marshes: strong and stable or weak and wobbly? Poster presentation at Pembroke College Graduate Conference, 16th June 2017 (Awarded 2nd Place). Brooks, H. Y., Möller, I., Spencer, T., Royse, K. (2017). An analysis of salt marsh and tidal flat geotechnical properties and consequences for marsh stability. Poster presentation at ESRC 2017 Poster Exhibition, Cambridge. May 2017 (Awarded 1st Place). Brooks, H. Y., Möller, I., Spencer, T., Royse, K. (2017). Analysing marsh geotechnical properties and implications for marsh stability. Poster presentation at Young Coastal Scientists and Engineers conference, Bath, 11th-12th April 2017 (Awarded 2nd Place). Brooks, H. Y., Möller, I., Spencer, T., Royse, K. (2017). Analysing marsh geotechnical properties and implications for marsh stability. Poster presentation at CEEDA 2017 conference, Cambridge. April 2017. Co-convener and chair of session at EGU 2019. Session title: "Coastal wetlands: their processes, interactions and future". Session Chair at CEEDA conference 2019.